The over three-year-old cold-blooded murder case of a Nihang leader, Bhai Malkit Singh Phoola, who was shot dead by some persons at his Bhai Randhir Singh Nagar residence here, took a sensational turn here today when the police arrested four of his alleged contract killers who were allegedly hired by the deceased’s wife. 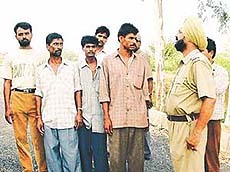 A ‘demoted’ employee of a petrol station at Sarabha village has been arrested by the Jagraon police today on the charges of stage-managing a robbery of Rs 83,000 belonging to the owner of Om Filling Station, Sarabha, and allegedly looted from him by two robbers near the village yesterday morning. Kimti Lal Jain, Chairman of Arihant Industries, has reportedly been evading arrest the past few months in a case of non-payment of dues to Standard Chartered Bank. The arrest warrants have been issued by, Mr R.K. Bhoria, Recovery Officer, Debt Recovery Tribunal, New Delhi. It is for the second time that the tribunal has issued warrants and dispatched them by hand since earlier warrants were reportedly returned unacknowledged. Can the status-quo orders by a civil court be overlooked to take the possession of a piece of land on the plea that as per the revenue records the land is mutated in the opposite party’s name? The answer seems to be in the affirmative if the local administration’s move to send a party to vacate a piece of land in Jainpur village is any indication. Is police not taking action under pressure? Is the local police dillydallying with regard to the registration of an attempted murder case under Section 307 of the IPC on the complaint of Mr. Ashutosh Vinayak, secretary, Vidya Pracharak Sabha, and a former state president of the BJP’s youth wing? A list of new office-bearers of the PWD Public Health Punjab Employees Union was announced during their general body meeting here today. ASK a school urchin the number of playing members of cricket, football or hockey team. Instant answer, 11. Courtesy, media. Despite a shift in values or economic constraints, some families enviably love sports/athletics. A few contribute sportspersons athletes. Weightlifting and wrestling, basket-ball and shooting easily visible. Athletics nearly O.K. 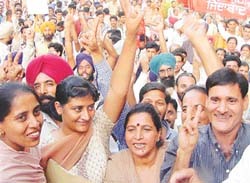 Academics, good despite poor literacy rate of Punjab. Three masked robbers struck at migrant labourers’ quarters in Giaspur Colony, here this morning and murdered a man and injured two with sharp-edged weapons. They decamped with cash and valuables. A migrant labourer was found murdered at Bulara village under Shimla Puri police station last night. The police has rounded up four persons suspected to be involved in the crime and said their identity would not be revealed today. A man was crushed to death by a bus near Maloud on Thursday evening. The deceased has been identified as Tek Singh, son of Balwant Singh of Siar village. The driver of the bus (PB-10-A-9318) fled leaving the bus behind. The Honda Activa celebrated its first anniversary here today. According to Mr Vinod K. Goel, Managing Director of Sarvpriya Honda Autos Private Limited, 1,800 scooters were sold during the past year. Minimisation of cost of production and sustainability of natural resources are the prime concerns of present day agriculture and ‘Zero Tillage Technology’ can go a long way to move our agriculture in this direction. Allaying the fears of the farmers that delayed rains may affect the rabi crop adversely in the state, the Director of Agriculture, Punjab, Dr Rampal, said today that the delayed rains would not have any effect, rather these would help in recharging the underground water. The Bharti Kisan Union (BKU) and the International Human Rights Organisation (IHRO) will hold a protest march from Ludhiana to the SYL canal at Manpur-Khant (Kajauli) village, near Morinda, on August 20 where a rally will be held to asserts Punjab’s sovereign right over its rivers. Mr D.P. Singh has convicted Narinder Singh, owner of N.S. Industries, and sentenced him to undergo six months’ imprisonment, besides imposing a fine of Rs 2,000 in a cheque-bounce case. 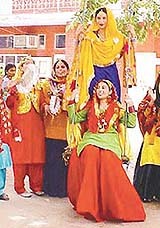 Teej was celebrated with much fanfare and enthusiasm at Guru Nanak Girls college by the staff and the students alike. The celebrations were inaugurated by the Principal, Ms Charanjit Mahal, who joined in the festivities with true spirit and recited a ‘boli’ and performed giddha with members of the staff and students. The college was decorated gaily with colourful swings and stalls displaying bangles, bindis, parandas and folk jewellery. ‘‘Success does not knock at your door. If you want to achieve success, you have to be very positive, confident and a hard-worker’’, these were the views of Rajat Chander Lal, a city boy who was chosen ‘‘Kingfisher - Face of the Year 2002’’ at the India Fashion Week, celebrated at the Taj, New Delhi from August 2 to 8. 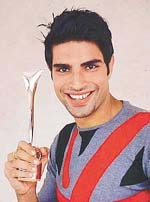 Rajat, with his ‘‘Kingfisher Face of the Year-2002’’ trophy. VIKRAM Kohli, the new kid on the block, has come out with a solo album ‘Socho Kabhi’ with Universal. Although the market for private albums is not so impressive right now, Vikram, better known as Vicky is confident of his success. “To be frank I am not unsure. “Socho Kabhi’s is very good. All the songs are beautiful and have a unique quality. CONJUNCTIVITIS is more common in the monsoon months than during the rest of the year. Also known by the descriptive name “pink-eye”, it is an inflammation of the conjunctiva, which is the transparent membrane that covers the eyeball and lines the eyelid. The symptoms are redness in the white of the eyes, red and swollen eyelids, lots of teas and sensitivity to light. Kila Raipur Academy defeated the B Baker Club 2-1 and registered its second consecutive victory in the First PAU Gold Cup Six-a-Side Hockey League Tournament being organised by the PAU Hockey Players Welfare Association at the Punjab Agricultural University grounds, here today. This tournament is being organised in the memory of Narinder Singh Laddi, a national-level player who died recently.